Seriously, thanks to the Crochet Mood Blanket project, I can’t get enough granny squares. After seeing how many participants are learning to crochet via this project, I thought I’d revisit the good ol’ traditional granny square pattern. Though I admit that I did not do extensive googling, I did not find a great basic granny pattern out there in cyber space. I’m sure there are some, of course, and I’m sure there are YouTube videos or something too. 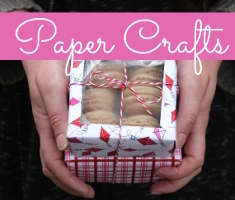 But, in the mean time, I thought I’d write up my own tutorial to share! This is really the easiest, quickest granny pattern that I know of. 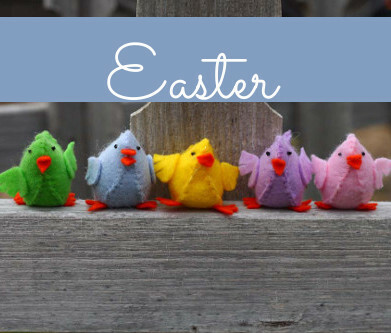 Since you crochet into the spaces of the previous round, there’s little room for error. This would be a great style for the beginning crocheter, and because this particular pattern is a bit tighter than others, a loose tension is more easily camouflaged. In an effort to make this easier for beginners, I will write out this tutorial in both longform and shorthand. Round 1 – Make a magic loop. Chain 4 (this equals 1 double crochet and 1 chain), make 3 double crochets in the loop and chain 1 (this is a granny cluster), make two more granny clusters, then 2 double crochets. (see photo 1) Slip stitch to the 3rd chain from the beginning, forming your fourth granny cluster and leaving one chain stitch as a space. (see photo 2) Pull the loop closed and sew the yarn end into the stitches. 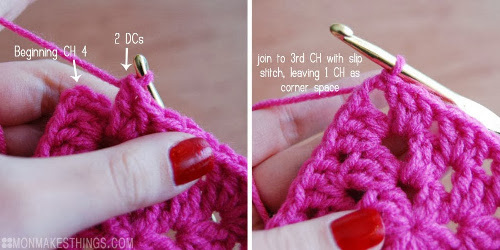 Round 3 – Slip stitch in the corner next to your hook. Chain 4, make 3 double crochets in the same space. Without chaining, make 3 double crochets in the next space between clusters (obvious in photos). Without chaining, make 3 double crochets, one chain, and three more double crochets in the next corner space. Repeat this around to the first corner. Make two double crochets in the first corner and slip stitch to the 3rd chain from the beginning, leaving one chain as the corner space. Round 4 – Slip stitch in the corner next to your hook. Chain 4, make 3 double crochets in the same space. 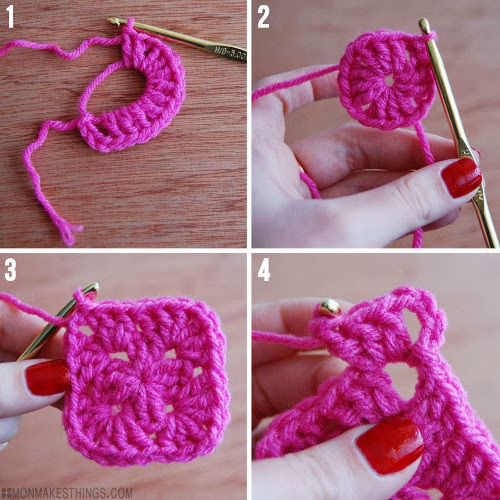 Without chaining, make 3 double crochets in each of the next two spaces. Without chaining, make 3 double crochets, one chain, and three more double crochets in the next corner space. Repeat this around to the first corner. Make two double crochets in the first corner and slip stitch to the 3rd chain from the beginning, leaving one chain as the corner space. Rnd 1 – Make a magic loop. Ch 4 [=1dc, 1ch], *[3 dc + ch 1 in loop],* rep from * twice, 2 dc in loop. (see photo 1) Slpst to top of ch3 [=1dc]. (see photo 2) Pull loop closed and weave in end. Rnd 3 – Slpst into next sp. Ch 4 [=1dc, 1ch], 3 dc in same sp. (see photo 4) *3dc in next sp, [3 dc, ch 1, 3 dc] in next sp,* rep from * twice, 3 dc in next sp. In beginning sp, 2 dc, slpst to top of ch3 [=1dc]. Rnd 4 – Slpst into next sp. Ch 4 [=1dc, 1ch], 3 dc in same sp. *3dc in next each of next 2 sps, [3 dc, ch 1, 3 dc] in next sp,* rep from * twice, 3 dc in each of next 2 sps. In beginning sp, 2 dc, slpst to top of ch3 [=1dc]. Here is a closer look at how the corner stitches are formed. Three of the four initial chain stitches in each round serve as the last double crochet in the last granny cluster. The final chain serves as the corner space. The only chain stitches are used for the corner spaces. There are no chains between the clusters along each side. The basic pattern is this: [3 dc, 1 ch, 3 dc] in each corner, and 3 dc in each side space. After round 4, you can continue this pattern until your square is as large as you’d like, or you can fasten off. 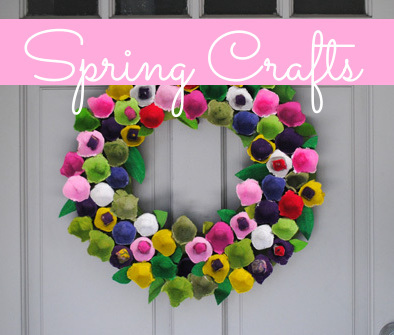 To add a contrasting border, fasten off and start a new round with your contrasting color. You can join your squares by whipstitching through the back loops, slip stitching through the back loops, single crocheting them togehter, or joining as you go. If you are unfamiliar or uncomfortable with the magic loop technique, you can also begin your squares by chaining 5 and slip stitching to the first chain to form your loop. This method will leave a hole in the center of your square. I think these old school grannies are pretty cute, myself! What do you think? Happy hooking! This entry was posted in Crafts, Knitting and Crochet, Needlearts and tagged Techniques and Mediums, Yarn Crafts on January 29, 2014 by Monica. Great instructions! I’ve knitted for over forty years, but just started crocheting, and an arm injury has made crochet a great therapy. I like everything to be nice and neat, and I’ve never heard of using the initial ch 3 for the final, not the first, granny cluster. Thank you! Makes perfect sense and appeals to my inherent Virgonean OCD. 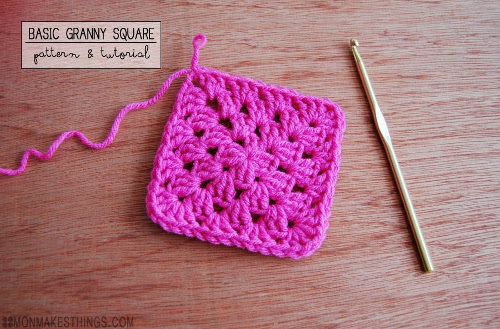 Maravilhosa a sua proposta de granny square. Very nice way of doing a granny. Haven’t seen it done this way. Like it a lot. Nicely written for a beginner. Keep up the great work.